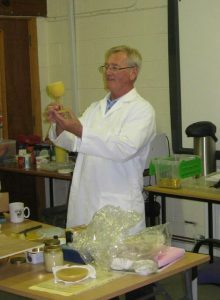 Our monthly meetings include beekeeping talks, demonstrations and a question and answer forum where members can pick each others brains for that useful tip. We enjoy meeting new people interested in our beekeeping and non-members are welcome to come along to meetings to find out more, have a chat and decide if you’d like to join our club. All meetings will start at 2pm, unless otherwise stated, and there will be a committee member present from 1:30pm if you would like to speak to them. Aimed at our beginners. From lighting a smoker to building a frame, Janet and Karl will be on hand to give any useful tips and tricks that will help you and answer any questions you might have. Even if you are struggling building a hive part…bring it along and we will get it made. – What limits the amount of nectar processed in the hive? – When do you take the last super off? – Is there an alternative to trying to annihilate every wasp within 5 miles of the apiary? – How do you actually go about selling honey? – What legislation do you need to be aware of? Following the presentation there will be a chance to “ask a beekeeper” panel, if there is sufficient time. Janet will be passing on her invaluable experience and showing us different methods on how to hopefully prevent our ladies absconding! It’ s all about the bees as we and Off-shoots celebrate “World Bee Day”. We will be inviting the public in, to find out all about bees and beekeeping. Karl Francis will be passing on his experiences on catching swarms, the tricks and gadgets he uses and how to set-up and use bait hives. A chance for our members to meet on a more social occasion over a meal and a chat about…you guessed it…Bees! Past winners from the club will passing on their tips on how to get your entry to the top. This year the judging will be carried out in front of the membership so it will be a great opportunity to see exactly what the judges are looking for and to pick up some tips on improving your showing of honey and hive products.